I'm doing something I've never done before. I'm rerunning a review. I spent last night at The Poisoned Pen in Scottsdale, acting as interviewer for Marion Moore Hill's appearance to talk about her books, including Death Books a Return. However, since I was doing the actual interview, I was not able to take notes. Instead, I'm reprinting the review I did when I read the book. Marion Moore Hill resumes her Scrappy Librarian mystery series with the second book, Death Books a Return. It's natural for a librarian with reference skills to dig into a town's history. It's not so natural for the librarian to become the target of a killer. Juanita Wills wants to write the history of Wyndham, Oklahoma, but finds a shameful event in 1959. A black high school athlete from the neighboring town of Bryson's Corner was brutally murdered on Wyndham's track soon after embarrassing a number of white boys at a track meet. 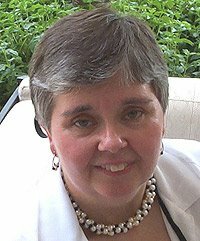 The case was never solved, and almost half a century later, Juanita still has a hard time finding people willing to talk about the murder. It doesn't help her research when one of her first sources is killed in Bryson's Corner before she can even talk to him. Suddenly, her research becomes dangerous. Hill tells a complex story of racial hatred and distrust, revealing the feelings that still last to this day. Her character's interest in the past stirs up emotions in two towns, and two generations. It's a thoughtful examination of racial crimes. Although I had a few problems with Juanita as a librarian, as a researcher she is persistent. 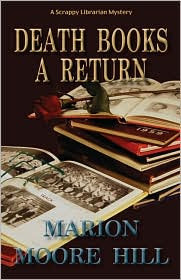 Her insistence on finding answers changes Wyndham, Oklahoma, in Death Books a Return. what were you problems with her as a librarian? She didn't spend near as much time in the library as she should have as Library Director. OK, picky maybe. But, she was dealing with budget issues, and she's running around all of the time. I know - suspension of disbelief. I guess that part just didn't work for me since I'm a Library Manager. I have stopped in a few times to check out your book reviews and just wanted to say that you do a fabulous job of relaying books to everyone. I would be interested in reading this book. I love mysteries and just finished a great one myself titled, "Threshold," by Bonnie Kozek- which left me in the mood to check out another murder mystery novel. Although the two books may differ somewhat- "Threshold" is a high-octane noir in-your-face thriller that continually had me on the edge of my seat! - Sounds like it may be a little more intense, however I am sure that I will love "Death Books a Return"- thanks for the great book tip. I get a lot of book ideas from you. Thank you, Becky. And, thanks for the tip about Threshold. It definitely is more intense than Death Books a Return. I hope you enjoy it. Most of all, thanks for the nice comment about the book tips!